1. Grizelmore the Goblin has some really weird cravings and eating habits. Tell us about some of your weird eating habits. Bonus point if you can show me a picure! Fold the bread over and enjoy! 2. In chapter 22 Aiode and her friends try to go and get their instruments replaced at the factory. There are a ton of different instruments there being made for the fairies, but man are they a fortune. Do any of you play any instruments? Have you ever played an instrument? If not, what would you play if you could? I played the flute for two years starting when I was nine but I had to give it up because we couldn’t afford to continue on with lessons. I think I only performed in front of an audience twice and fortunately that was one moment in my life that wasn’t caught on camera (seriously, I was one of the most photographed and videoed children in the world) but it was fun. I wish I still played, wind instruments are awesome! 3. Jason and the band are finally discovered by the elf (with the crazy long name) and Buttercake the freaking adorable unicorn who turns into something not so adorable. If you were a detective who would you choose for your magical accomplice? I just had to. 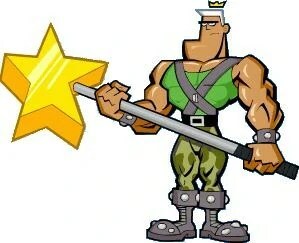 Jorgen von Strangle is awesome and he’s magical. Win! 4. The book ends on a happy but painful note. What do you think of the ending? Were you happy with the turn of events? I thought that the end was a-ma-zing! I love books that end with a lot of action and excitement that keep me glued and sad when the book finally ends. 5. Tell us your favorite quote(s)/part(s) from the book! Favourite parts? But the whole part was just one big piece of awesome cake! Am I allowed to say the whole book? No? Okay then, I’ll try to choose…. I think my most favouritest part of the book was when the band filmed the music video in Mitch’s house and brought the house down. Literally. That was absolute awesomeness!